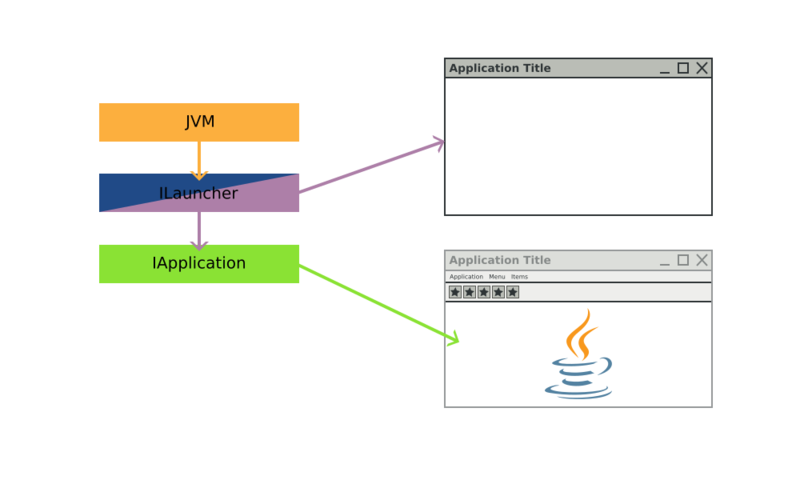 Let's talk about Launchers, and how they are used to start JVx applications. the JVM must have started. the technology specific system must have started. Then, and only then, the JVx application can run. Depending on the implementation that is used, that can be as easily as instancing the factory (Swing, JavaFX), but can also mean that a servlet server has to start (Vaadin). Because we do not wish to encumber our applications with technology specific code, we have to entrust all this to an encapsulated entity, meaning the implementations of ILauncher and IApplication. The first thing that must run is obviously the JVM, without it we won't have much luck starting anything. The launcher must be created and it must start the Technology. The launcher than creates the application which the user is seeing. So we need two classes, the ILauncher implementation which knows how to start the Technology and the IApplication implementation. That we already knew, so let's try to put this into code. For simplicity reasons (and because I don't want to write a complete factory from scratch for this example) we will reuse the Swing implementation and write a new launcher and application for it. // All we have to do here is kickoff the creation of the launcher. // The launcher will do everything that is required to start for us. // but we don't need any of that here. All we have to do there is start the launcher itself. As the comment suggests, there might be work required for a "real" application startup. For this example, it is all we need to do. Of course we could also directly embed this little function into the launcher implementation itself, to save us one class. // instantiated at that point, so we can't use UI components. // We must notify the application that we are being disposed. // the frame is disposed of. // created from now on. // Also we set it as our factory instance. // Now we create the main application. // Then we add the application as content to the launcher. // Perform some setup work and start everything. // We also have to notify the application itself. In short, the launcher is kicking off the Swing thread by invoking the startup method on the main Swing thread. This startup method will instantiate the factory and then create the application. From there we only need to set it visible and then our application has started. The launcher extends from SwingFrame, that is required because there hasn't been a factory created yet which could be used by UI components to create themselves. If we'd try to use an UI component before creating/setting a factory, we would obviously see the constructor of the component fail with a NullPointerException. The method startup() is invoked on the main Swing thread, which also happens to be the main UI thread for JVx in this application. Once we are on the main UI thread we can create the application, add it and then set everything to visible. The IApplication implementation is quite short, because we extend com.sibvisions.rad.application.Application, an IApplication implementation created with UI components. // Not required for this example. Because the launcher has previously started the technology and created the factory we can from here on now use UI components, which means we are already independent of the underlying technology. So the IApplication implementation can already be used with different technologies and is completely independent. As you might have noticed, in our example the launcher is a (window) frame, that makes sense for nearly every desktop GUI toolkit as they all depend upon a window as main method to display their applications. But the launcher could also be simpler, for example just a call to start the GUI thread. Or it could be something completely different, for example an incoming HTTP request. Also don't forget that the launcher is providing additional functionality to the application, like saving file handles, reading and writing the configuration and similar platform and toolkit dependent operations, see the launcher for Swing for further details. This example demonstrates how a simple launcher is implemented and why it is necessary to have a launcher in the first place. Compared with the "just set the factory" method this seems like a lot of work, but the launchers used by JVx are of course a lot more complex than these examples, that is because they implement all the required functionality and also take care of a lot of boiler plate operations. It is taking care of all technology specific code and allows to keep your application free from knowing about the platform it runs on.